Following an email from Russ about Charles Freeman’s theory and because David was exploring the painting issues with regard to the Shroud of Turin I thought I would put a few ideas forward. They are on the website under Why the Shroud of Turin is NOT a painting. You cannot fold and unfold a painting and then repeatedly store it folded without damaging the image along the fold lines. Imagine what the Mona Lisa might look like if it had been treated like the Shroud. The central image down the body of the Man on the Shroud would be missing in the gesso/paint or woodcut print theories because the central fold line was always predominant in the folds for each type of water/fire damage. It is a point worth making. However the Besançon Shroud, which no one disputes was a painting, was in use for at least 200 documented years before being destroyed. I wonder how that was stored? Perhaps the gesso-based paintings behave differently? Thanks Henrik for recalling me this interesting paper. There are some points I wish to comment. Looking at the many reproductions of the face (Fig.1), we better understand how far were the medieval painters from the concept of negativity. They tried to simply reproduce what they saw. They made several mistakes . In most reproductions we understand that they tried to “reconcile” the “strange” figure they saw with the usual characteristics of a human shape, an albedo (see for example the rounded open eyes). In the context of the Shroud, Negativity is linked to some kind of body/fabric distance. On the basis of the reproductions, it is even not obvious that a medieval painter could think in such a way. Some of the reproductions do show an attempt to reproduce the faintness of the image. This fact implies that about 150 years after Lirey, the Shroud image was more or less as faint as today. Fig.23 and 24 show pigment flakes, not found on the Shroud. For some of you, the pigments disappeared with time and/or (alleged) washing etc…living only the medium (Gesso, Gum Arabic ….). Even in this case, I think it is impossible for many reasons. ‘Some of the reproductions do show an attempt to reproduce the faintness of the image.’ A point I’ve made several times. 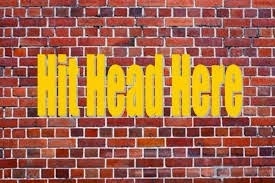 Apparently falling on some peoples’ deaf ears. Thomas, as you know I rely heavily on the depictions and descriptions of the Shroud that put together give a very strong case for the more prominent nature of the images as they were originally. It is surely wrong to neglect these particularly when observers note the Crown of Thorns in place and one can also see it in numerous depictions. conditions or made of something more solid than linen and pigments. So it makes sense to take as the secondary aim of all Shroud research – what did the Shroud look like when it was ORIGINALLY made. This is the focus of my own research. The primary aim is,of course, to establish what kind of loom the Shroud was woven on as the weave comes before the images and if you can date the weave then you have a basis to work from for the creation of the images. I have not yet found a weaver specialising in ancient textiles who thinks it is anything other than a typical weave of a medieval treadle loom so it is over to the authenticists to challenge this. It is the width, a standard medieval treadle loom width, and the length that gives it away. I have no problems with Hugh, in his recent editorial, and in the review of my article ,in saying my article is not definitive. We do need a database of all the copies and the depictions of the Shroud before we can fulfil the second aim of defining what the Shroud once looked like. This seems so basic! I have searched high and low for other liturgies that involve the display of a painted linen cloth with images of the buried Christ on it. The Quem Queritis ceremony certainly did but there may be others. And everyone ducks the sudden appearance in the fourteenth century of the all over flagellation marks that are seen in sculpture and painting. I have provided, courtesy of Professor Marrow, an explanation of this based on scriptural inspirations. You need to provide evidence that ancient scourging did in fact cover the whole body front and back. To take up a point Hugh (?) made in his review of my article, once the pigments started to flake off or disintegrate ( as they do appear to be in the 1868 exposition when the Shroud had to be shown in a frame for the first time,) then they would gradually all come off- perhaps in one of the thirty year storage periods of the nineteenth century. Normally the linen would then be thrown away but the Savoys could hardly throw away the Shroud. And I suppose they could hardly repaint it although we do know that some painted linens were touched up when they began to fade. So, as I said in an earlier posting, we are at the stage of research on the Shroud, with many false avenues taken so far, that the Egyptian pyramids were in the 1880s. The first task is to assemble the evidence of the Shroud in the past in a way that is open to scholars to examine and compare. The depictions. The fullest set is from the catalogue of the Savoy collection, 1998 although some of these were apparently destroyed. I have checked through my 35 photocopies ( hard to find the catalogue but the Cambridge University Library has a copy) and every single one shows the long hair and the Crown of Thorns in place. Then there are the examples on display in Turin in the Shroud Museum- i assume they will have more in storage. Then Beldon Scott has made his own collection – many illustrated in his book on the Shroud. But there must be many more- I tracked down one from 1608 in the British Museum and the Royal Library in Turin sent the HT picture researcher one we had not asked for that I had never seen before- so I assume they will have others in the Library. Gathering these depictions together would not be difficult for a Master’s /PhD thesis, the problem would be arranging and paying for the copyrights so that the whole lot, plus the copies, could be put on the web and made open to anyone interested as in Mario’s Shroudscope. Then we really would be able to get a move on! Of course, the pigments on the Shroud appear to have long since gone, suggesting that the rolling unfolding,etc, did eventually lead to them disintegrating. Pam’s other point about the identity of the artist. No, these were seldom recorded we are lucky when they are in this period- not until the sixteenth century that artists, with a few exceptions such as Giotto, had status greater than ordinary craftsmen. And if you read the articles in Villers ( and why not Pam if you want to comment on paintings on medieval linens) you will find examples of enormous sophistication which make the artist of the Shroud look like an amateur. Just look at the linen processional banner of the Intercession of Christ and the Virgin ,attr, to Lorenzo Monaco, c.1400, explored in the article by Charlotte Hale, p.31 onwards. From what STURP found the calcium was consistent across the whole surface. This fits,of course, with a medieval sealing, but means that the Shroud must have been laid out flat without anything on it to let calcium settle naturally from another source across the surface. ¿Es usted consciente de la “barbaridad” que expresa?. La bellísima obra de Lorenzo Mónaco sería desde el punto de vista anatómico una CARICATURA, y usted jamás encontraría un médico que avalara en ella un carácter REALISTA. Where is this photograph? In the article or elsewhere? Google does not provide any high resolution picture of this veil. Please, show us the Villers article, the photographs etc. Without any kind of concrete example, this discussion is meaningless. The Villers book is available second hand on Abebooks at a very reasonable cost so perhaps you can get your own copy and learn a great deal about painted fabrics from the article and the others. It would make the debate a lot more relevant and sophisticated. Yes, there is a photo in the article,of the Veil as it was before the war and then afterwards so that you can see the contrast between the central area where the pigments have come off and the surrounding panels where the paint is still largely intact. Then there is a photograph of one of the panels where the pigments have come off- it is of the Visitation- and you cannot help noticing how similar the shadowy images of Mary and Elizabeth are to the shadowy images of the Shroud. It is without doubt an avenue for further research. This is one of the many areas where research on the Shroud is in its infancy. You will no doubt remember the quite extraordinary statement in the STURP paper on the Physics and Chemistry of the Shriud that they had not examined any paintings on linen! Never too late to start. Pam also speculates that the limestone may have come from the dust of a newly hewn tomb. In that case one might suppose that the back of the dorsal image would have become quite dusty, but not, especially, anywhere else. The next densest accumulation would be the back of the ventral image, which was exposed to dust drifting from the ceiling for some hours, but I would not expect ‘relatively large’ concentrations on the image face of the cloth at all. Over the years much or all the dust would no doubt have been brushed/washed off, and maybe a little diffused, but surely any remaining would still be concentrated on the back of the dorsal image. There is no suggestion, among the various investigations into the hooverings from between the Shroud and the backing (applied after the fire of 1532), that this is so. Beware folks. English gents who write history books are not one and the same thing as academic historians. Charles is not qualified as a Medieval Historian but only as a Roman Historian. The Quem quaeritis? (Latin for “Whom do you seek?”) Easter trope dates from the early medieval period. It was (first?) sung as early as ca. 925 CE at the Benedictine Abbey of Fleury (now Saint-Benoit-sur-Loire) funded ca 630 CE. The Visitatio sepulchri liturgical drama is derived from the The Quem quaeritis? Easter trope. In the Benedictine Hungarian Pray Ms bifolium illustrations (1163-1195 CE), the Visitatio sepulchri section (with the central “a” for Greek-Latin anesti, “He [is not here but] is risen”), the Benedictine monk (Joseph Almos?) cryptically “stages” (i.e. without the image on it) the Constantinople Sindon aka Lirey Shroud aka Turin Shroud that is Yeshua’s burial Sindon as the true relic (not a painted copy dating from 1325 CE± 65!). As note (2), I also wrote: The Greek word, aperilepton (used to describe the image on the Constantinople Sindon), is consistent both on one hand with G-od’s “un-circumscribed”, non coercive and loving, divine nature that has NO SHAPES, is BEYOND DESCRIPTION and the binds of Death cannot contain and, on the other hand, Yeshua’s “UN-OUTLINED”, EVANESCENT NATURE of his own image on his sindon. This doesn’t refer to an originally painted copy as Charles wants us to believe. I would be grateful if you can specify from where have you got the name of the artist (or copyist) and the date of the illuminations of the Pray codex. Thank you. “Reminder: most likely the Benedictine monk artist followed the court of young prince Bela (future king of Hungary) at Constantinople and saw the Constantinople Theophoron (Christophoron) Sindonos, “the piece of linen worn by G-od (= here Christ) there. Now young Prince Bela and his court stayed in Constantinople from 1163 to 1173 CE. Here 1163 CE is the teminus ad quo i.e. the lower limit of dating, as of the earliest plausible date at which the pen & ink bifolium illustrations could have been drawn. Re the terminus ante quem or date before which the bifolium illusrations must have been drawn, 1195 CE, the bifolium musical notation just gives it away. “Now young Prince Bela and his court stayed in Constantinople from 1163 to 1173 CE. Here 1163 CE is the teminus ad quo i.e. the lower limit of dating, as of the earliest plausible date at which the pen & ink bifolium illustrations could have been drawn”. Excuse me, Max, but this is a simple speculation. You must get any indication to connect the Prince’s visit to Constantinople to the Pray codex. I am asking you for specific evidences (History) not imaginative speculations (novels). Do you have any evidence? (I await for this continuation). Firstly you misleadingly present Prince Bela’s TEN YEAR’S STAY (along with his court) at Constantinople as if it were ‘(a mere) visit’ to the Byzantine capital! Are you kidding? Could you stop shamelessly distorting the fact? Secondly, you seem to totally ignore Medieval Christian princes (and 12th c. CE Hungarian princes are no exceptions) used to have a confessor and spiritual director at their court. Now most of the time, their confessor and spiritual director was a monk. Thirdly, a Benedictine monk drew the bifolium’s pen & ink illustrations. Though predominantly Roman in style, remarkably, a clear Byzantine influence can be felt in all of them (elongated figures, dressing etc). To picture Yeshua’s elusive DEAD naked body on his burial cloth would have confused the Visitatio spulchri message (“HE IS NOT HERE but is risen”). The elsive nature of the TS image makes all the difference with Charles historiosophism. Yes, the TS image is elusive, or at any rate the one that people see with their own eyes on rare showings in Turin. That much we know because of the many statements that one has to stand well back (metres) to discern the form of a man, and that the image ceases to become visible if one gets too close. (I have to take the word of others for that, but see no reason to take issue). But that creates a conundrum, does it not? If the human eye cannot make out the image close up, then how can the camera do so? What is a camera, but a primitive eye? One has to assume there has been some playing around with lighting and exposure settings etc to give the photographic images upon which we amateur image analysts are so utterly dependent. There’s an upside to that too. If the original photographs have been doctored in some way to make them more understandable, then who’s to say we have been given the optimal settings (sorry Mario ;-). If for one shamelessly put Shroud Scope and Halta Definizione images into my MS Office Picture Manager, and often find there are effects that are interesting and possibly even scientifically significant (who knows?). So when a historian comes along and says that this or that part of the TS image is missing, be it hair on back of head or crown of thorns or loin cloth, the first thought that enters my head is “How can you know what’s there and not there, given you are restricted to the same images as the rest of us? Back in November of thereabouts I reported some interesting differentiation to be seen between hair and at least some skin body image that was best seen with the Halta image. I described a “two-tone effect”, that may or may not have implications re mechanism of imaging (that need not concern us right now). I’ve just this minute put the Halta images from the BBC’s site back into MS Office to look again at the question of hair length in the dorsal image. Is anyone thinking what I’m thinking? Methinks there are no grounds for saying that the dorsal side image shows lack of hair, or short hair, least of all for claiming that long hair is absent. Oh, and while we’re discussing the head, there’s something worth noting re that “missing” crown of thorns. There was a posting on this site a while back about someone who thought there were horns coming out of the head, which was clearly based on a misinterpretation of the edges of a water stain. One wonders if some medieval artists made a similar error, but interpreted the water stain edges as thorns, or the remains thereof. As a general observation, if one’s to sustain the case for crucial parts of the image being missing through wear and tear, one has to demonstrate that the effect is seen elsewhere on the TS, and not just at one or two other ‘controversial’ sites like loin cloth (where artistic sensibilities play a role). Personally I see no evidence whatsoever for any major, generalized dropping off of image. To claim that a crown of thorns and/or loin cloth is missing through wear and tear is simply casual guess work. It’s not scholarship. Nor is it scholarship to claim that others will prove one right in the fullness of time, once there’s been a proper stocktaking and evaluation of the entire canon of Western devotional art. It’s the scholar making the controversial claim who is supposed to do that, or at least make a systematic start. MA and PhD dissertations invariably require hard slog. ‘Restricted to the same images as the rest of us’ . So have you access to the catalogue of the Savoy collection and Beldon Scott, plus the others I have? I have about fifty images of the Shroud mostly by artists of the seventeenth century and then up to 1750. So are these the same images you are using? 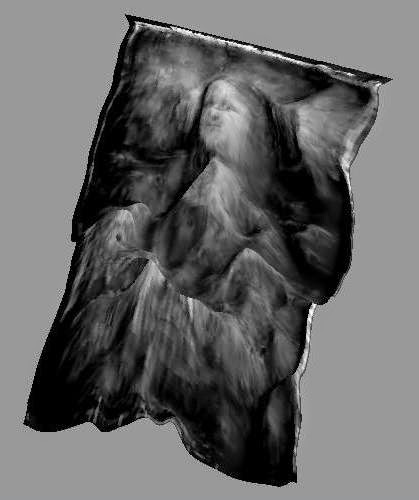 As I have made clear I am trying to recreate the images on the Shroud as they originally were, a fairly standard approach to such matters! By opening up a database to everyone , I lay myself open to being shown to be wrong. I am quite happy to take the risk. To rule out even trying to get a database together shows a really closed mind! The lengthy preamble and context should surely have made it clear that it was photographed images> of the TS that were in the frame. Yes, a limited part of the total evidence that needs to be accumulated if Shroud studies are to move on. The controversies over what the Shroud photos do or do not show and how far some have been manipulated show that this is a confused area. If the shroud was made for the Quem Quaeritis rite, it was important that it did not depict a dead body for exactly that reason. But that is exactly why the Shroud does not depict a dead body. It depicts the imprint and bloodstains left by the body, and that is why it had to be monochrome, to resemble an imprint left by sweat or decay, and to have the negative quality that would result from such an imprint. Primitive though it was, the Besançon shroud had similar features, I believe, and Bergier indicates that these two were far from alone. “Imprint”? “Monochrome” ? “Negative quality”? Where on earth did you dig up these obscure and perplexing terms, Hugh? Spare a thought for your audience please, historians especially. Young’s research shows that there was considerable variety in the linens ( always linen to conform with the gospel accounts) that were presented to the congregations and one can assume that there was no one standard image although shared knowledge e.g. to put the wound on the left side- must have been passed around. Some may have been just the sudarium and some may just have had bloodstains. There clearly was not a standard Quem Queritis image. The Mozarabic rites that go back to the seventh century in Spain talk of Peter and John going to the tomb and seeing ‘the recent imprints of the dead and risen man on the linens’ . Yes, these were intended to be imprints – everyone would have known that a body with sweat and blood on it laid on a cloth would leave some sort of imprint, if only bloodstains, and it would be a negative of the body itself and the artist depicting it might well have decided not to use as many colours as the top class artists of the day ( judging from the few top-class painted linens that have survived). After all everyone seeing the cloth would have known that it was not the real thing but a symbolic representation- ‘our’ parish or monastery shroud brought out once a year at Easter . ( ‘Representation’ is the word often used of the Shroud image although there is a linguistic barrier here). However, as this was a revered cloth, carried in procession, laid on the altar, etc , it would have achieved some form of spiritual significance and have been treated with reverence, probably locked up between Easters. In some cases miracles would have been reported and then the cloth would have been given even more status and one might even get a pope allowing pilgrims an indulgence. ( As is the case in similar objects- we have a banner made in 1464 in Perugia, carried in penitents’ processions that became associated with the cessation of plague and so, like the Shroud, got an indulgence even though everyone knew it was recently made.) This is the way these things tended to work even if we don’t know exactly what gave the Shroud sufficient status to earn that indulgence. There is lots of material on how particular objects were transformed into apparently genuine relics although nothing survives of this for the Shroud except the prominence, I think, of Jeanne de Vergy in the attempt. My favourite is the opportune discovery of the body of Mary Magdalene at St. Maximin in Provence in 1279 when there was already a Mary Magdalene body at Vezelay. Here Charles of Salerno won out by saying he had a vision of where to dig and the body would be recognised by the amphora of Christ’s blood that Mary had gathered at the cross and a green shoot growing from her tongue. And this indeed was what was dug up. The poor monks of Vezelay had nothing to challenge this and their shrine soon lost out to St.Maximin where pilgrims still come to this day. Hugh, “in modern language, sophist and sophistry are re-purposed and used derogatorily. A sophism is a specious argument for displaying ingenuity in reasoning or for deceiving someone. A sophist is a person who reasons with clever but fallacious and deceptive arguments”. In this acception, Charles’s intellectual approach looks more like an historosophist’s than an historiosopher’s as far as the TS is concerned. Hugh wrote, “It depicts the imprint and bloodstains left by the body, and that is why it had to be monochrome, to resemble an imprint left by sweat or decay,”. The fact is In the very iconological economy of the bifolium Prepartio/Unctio AND Visitatio scenes, this reasoning just doesn’t work. Don’t you mix drama-oranges and iconogaphy-apples. Besides most likely the Shroud of Compiegne and Sindon Munda from Kornelimünster are two halves of one original subtitute relic about the same length and width of the TS yet it clearly doesn’t bear any dorsal and/or ventral monochromatic image at all to resemble an imprint left by sweat or decay. Max, this is not true. “According to tradition, this cloth was used when Jesus was laid in the tomb. It is an artfully woven linen cloth, comparable to an ornamental cover. It is approx. 1.80 m wide and 1.05 m long. Oskar I wrote: “Besides most likely the Shroud of Compiegne and Sindon Munda from Kornelimünster are two halves of one original subtitute relic about the same length and width of the TS”. Now, you commented : “Max, this is not true. (…) It is an artfully woven linen cloth, comparable to an ornamental cover. It is approx. 1.80 m wide(sic!) and 1.05 m long (sic). Oskar, methinks you got it all mixed up here. Known as “SIndun Munda” (i.e. “the clean/pure cloth” in clear reference to the Matthean “Sindon Karthara” (Mt 27: 59), the Charlemagne’s original substitute relic (that was twice as large as the Kornelimünster “Sindon Munda”, that is approximately 4m long and 1m wide (the second half used to be kept in Compiègne till it was destroyed at the French Revolution), WAS about the same length and width as those of the TS. Is it not easier to explain added details in a copy of a faint original than to explain why the artist chose to paint a faint copy of the much more vivid original? I do not see any added detail in this beautiful copy. To the contrary I do see some missing details (for example the epsilon blood mark). The attempt to create a faint image with fuzzy contours is obvious. It is the best example of such an attempt but not the only one. Why a painter of the 16th century would reproduce a faint image, if the original was not faint at the time? This is a non sense. 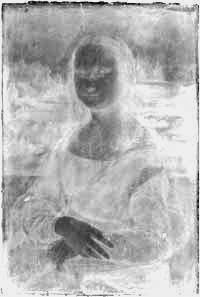 We can be sure that in 1527 the image was about the same as the Turin Shroud we see today: a faint image with fuzzy contours an without any added “details” like a crown or a loincloth. The observation of this beautiful and successful reproduction of the TS before the Chambery fire is very interesting. I’ll look at it in detail. I was not very clear (english is not my native language). What I meant is that the SOT in 1527 probably reminded more about the Noalejo copy than the depictions Charles Freeman usually refers to. Thank you for making that more clear. The image is very interesting and is evidently a copy of the ORIGINAL realized using A MIRROR. The artist, Gir, gives the key putting the TEXT of way to speculate. La imagen es muy interesante y es evidentemente una copia del ORIGINAL realizada utilizando UN ESPEJO . El artista, Gir, da la clave poniendo el TEXTO de manera especular. La imagen y el texto deben ser vistos con un espejo. Es probable que Gir encontrara una mejor manera de poder copiar de esa curiosa manera. It is very difficult to find good photographies of the POSITIVES of the Shrouds of Noalejo (typical Spanish! …… will be necessary to hope that some japanese or korean tourist realizes them …), specially of the Shroud of better quality. Es muy difícil encontrar buenas fotografías de los POSITIVOS de las Sábanas de Noalejo ( ¡típico español!……habrá que esperar a que algún turista japonés o coreano las realice… ), especialmente de la Sábana de mejor calidad. Are you sure that the illustrated copy, above, is of the Shroud which was in Chambery at that point. The wound is on the wrong side and the bloodstains of the Shroud are not reproduced, but perhaps you have documentation to say that it is. One area to research is whether there was in fact a Spanish template for Quem Queritis cloths with a double figure on it and it may even be that the Shroud is a copy of that template- there seems to have been a double image in the cloths mentioned in the Mozarabic rites that go way back before the fourteenth century. So much still to research! But isn´t the text on the side inverted? The image posted above shows the reversed side of the shroud? It would then explain the mirror-image. Excuse me. I cannot see “in 1527” neither in the picture nor in the transcription: “Sindonis imaginem sacri Chambariaci saccelli cernere hic potest recta dimensione per Gir. Actum”. The reasons of the dating would be others. Have you seen the dorsal part of the two Noalejo shrouds? The article by Barta and Carrascosa which I linked to in my first post above shows the whole Noalejo cloth outstretched. Although the resolution is poor, it is possible to distinguish the date of 1527 down at the left corner. I will though grant Freeman the point he frequently have made about the visible elbows which can be seen in the dorsal images of the two pre fire Noalejo copies – this will surely add some constraints on how the shroud wrapped the person/object during image formation, like if the person/object would have had to press the dorsal side of the shroud into spices/sand, or if the person/object never was used in the first place. To have the person in a loose shroud on a flat floor resulting in visible elbows on the dorsal side is of course an anatomically absurdity. 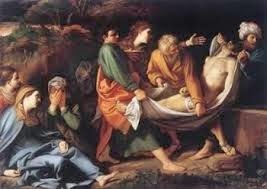 There was an opportunity for imprinting, real or simulated, before placing on a hard stone bench Henrik, one that medieval artists with a knowledge of scripture were aware, notably the juncture at which Joseph of Arimathea makes his first appearance, i.e. tricky, cumbersome and no doubt messy transfer from the cross into an improvised fluid-absorbent linen “stretcher”. There was ample opportunity for imprinting of those elbows (albeit notional) in the above painting. That same configuration we see above could also explain why the artist who produced the 1516 Lier copy decided to show a highly prominent imprint of the buttocks. That unexpected dare one say indelicate feature was alluded to shortly before Christmas by Hugh Farey, inviting us to speculate. Might the Lier artist have been assuming that imprinting occurred en route from cross to tomb? It would explain why blood, real or simulated, is so prominent a feature of what is routinely (misleadingly?) billed as a “burial shroud”. As I mentioned a while ago, there’s really no good evidence from scripture that Joseph’s linen was ever used or intended as such (quite the contrary in fact from the account in the non-synoptic Gospel according to St.John). It´s possible that medieval people understood the role of the shroud mentioned in the gospel, at least partially, as a carrier of the body to the tomb. That Jesus was placed in the shroud before entering the tomb is certainly consistent with the most straightforward reading of the four gospels (and don´t forget the linen strips). This does not exclude the possiblity though that Jesus remained in the shroud during the entire stay in the tomb (but you think that the Gospel of John suggests otherwise?). Maybe they interpreted the visible elbows as proof of an image formation taking place during the initial phase while the body where carried down from the cross or to the tomb – I don´t think that´s a very strong point in itself – without asserting that the elbows don’t fit into your historical reconstruction or your school of image mechanisms. All I’m saying, Henrik, is that elbow imprints on the dorsal surface may or may not have been present originally, depending on events (authenticity) or modelling assumptions (medieval origin). That being the case, no firm conclusions can be drawn from the presence of elbows in later “copies” , not necessarily faithful to the original. when the region of the TS in question was obliterated by fire in 1532. It’s not just a single can of worms. It’s 2 or 3 cans of worms, not necessarily the same variety with no way of knowing which is which because the labels have been burned off and/or been re-labelled freehand with marker pen by an unknown hand. Sorry, I couldn’t resist making the point that elbow imprints, had they been present, would square with prominent buttock imprints if the TS image had been imprinted on linen during transport to rock tomb before questionable burial rituals ones that may or may not have involved cleaning off first-flow blood. Imprinting during transport makes medieval model-building options a lot simpler to imagine, e.g.simple sweat and blood imprinting, through excluding more exotic resurrection-linked phenomena (flashes of radiation etc). We down-to-earth sceptics who consider that a rerun of the radiocarbon dating would return essentially the same answer have to to seize the opportunity for point-making when offered, given we have no exotic narratives up our sleeves with which to grab headlines. Nineteenth (and earlier) century enthusiasts for other shrouds were happy to accept that they were all genuine, and did indeed give the Turin shroud the role of transport sheet, while their own favourite (Cadouin, Besançon) was the actual burial sheet. “In 1527” is not present anywhere on the Noalejo’s shroud. It is a free translation of the text. This is not serious from the point of view of the epigraphy. In fact any serious investigation has not been made about this artefact. Neither an article published in a specialized review. We are only able to follow the trail of it till the beginning of the twentieth century. Therefore, before to draw any conclusion some expert enquiries have to be undertaken. In particular the dating of the cloth and paint, textile and epigraphic studies, and others. Without that, we can only speculate. For example, we cannot exclude that the cloth don’t be a free copy of a copy of a copy made in more recent date than 1527. If these enquiries confirm the date that figure on the cloth, Charles should reconsider some points of this article. The colour of the Noalejo’s image is not so faint like the Turin Shroud, but much more than the copies that Charles has used as reference. Any degradation process would be previous to 1527. “The Shroud of Turin and its ancient copies” César Barta and Alfonso V. Carrascosa. This article fails to satisfy the basic requirements that I demanded. The magazine is not a reliable scientific review. (This subject was discussed in Dan’s blog not long ago). The authors are not specialists in Archaeometry, textile History, Epigraphy, etc. Therefore they have not made any of the studies I mentioned. They only made a comparative study of the superficial features of the Noalejo shrouds. The same thing can be stated for The Noalejo Shroud copies by César Barta, José M. Orenga and Daniel Duque if not worse. (https://www.shroud.com/pdfs/n69part2.pdf). Por cierto, que yo sepa “Gir” no es un nombre español. By the way, “Gir” is not a Spanish name, as far as I know. P.s. Still no answer to my query as to why there is long hair and the Crown of Thorns on all the representations of the Shroud in these early centuries but they are not there today. The obvious answer is that they were indeed there but have decayed but perhaps you have a better explanation. I am sure the Turks would have been mightily impressed by those faded images! David Mo is right- we need a lot more research on these so-called copies. Once again it is always assumed in Shroud research that an image on a cloth is miraculously preserved as it was when it was first created- but images on linen will fade if they are exposed to a lot of light- how can we be sure of this in any one case without further examination? There does seem to be a faint line across the forehead of the Lier copy which may be the remains of the Crown. The Crown is ,of course, shown in numerous other depictions of the Shroud and in some of the copies. ?All invented. Do you think the Getty Foundation might fund that database? Well, you can choose to keep being highly selective, that’s your prerogative. But its not academic nor objective. De Beatis, I’m sure, is referring to the blood wounds resulting from the crown on the head as we see them today… the context of the whole sentence is around blood wounds, not body image or other forms of image. You are absolutely correct, Thomas re the misreading of syntax. “Marks” is followed by “of” and then subclauses with more “ofs” which are clearly governed by the single priming reference to “marks”. Given the marks linked to scourging, nails and lance are not accompanied by the actual hardware that inflicted the wounds, the latter identifiable only by their respective blood signatures, there are no grounds for assuming that the “marks” left by a crown “of” thorns represent the crown itself. The writer was simply deploying a compressed style of syntax as a means of bookending the 4 different origins for the blood stains each inflicted by a missing object. I don’t have the original Latin to hand , someone must have, but when you see the crown depicted on so many otHer engravings it does fit and the attempt here to explain it away does not make much sense when there is visual evidence that correlates with the description of a Crown. So is the argument that there was not and never was a Crown of Thorns on the Man on the Shroud, shown front and back on both images? Even most of the (perhaps faded , that needs some thinking about) show it. The full quote ( but, of course, only in English translation of the Latin original ) is’ shows most distinctly ( N.B.) the marks of the scourging, of the cords about the hands, of the crown on the head . .’ I think it is pushing it a bit far from this to say that the Crown was NOT there especially when there are so many depictions of it. Each copy, engraving, woodcut, lithograph, etc is unique in so far as it was made by a different ( and in most cases of the engravings, etc we have a named artist) artist and a date as most of these depictions, unlike the copies, were of particular exposition. We cannot divide the copies as somehow being better evidence than the depictions. Some of each will have vital information. The only way forward is to put them all together on a database and get specialists working on them . But images on cloth do fade far faster that engravings. Postscript to my earlier comment re the intrinsic unreliability (?) of what one sees, or thinks one sees, or thinks one cannot see, in photographs of the TS. I’ve just recalled that last year I suddenly remembered there was a scanner on my inkjet printer, and used it once or twice to record model scorch images, instead of my handheld digital camera. The results were at least as good, indeed better, which is perhaps not surprising if I’m right in thinking that electronic scanning dispenses with converging lenses and other optics, as well as using uniform strip-lighting that is normal to the item being scanned. Does anyone here know how the Durante and Halta Definizione images were each obtained? Might one have been a photographs in the first instance, the other a scanned image? I seem to recall seeing a gantry/guide rail type arrangement mounted above the TS in 2002 pictures of the recording set-up, but what was the mobile unit – a lens and camera or ‘merely’ an electronic photocell? What would be interesting at least to this neophyte Shroud researcher, aka Johnny-Come-Lately (thanks Mr.Rolfe) would be to find that one was photographed, the other electronically scanned. It might help explain the two-tone effect seen in the Halta image (above) but barely detectable when I last checked Shroud Scope (Durante) images despite identical photoediting (same brightness/contrast/.midtone settings in MS Office Picture Manager). Maybe one system sees/detects things the other doesn’t. If scanning were superior, and the two-tone effect scientifically-significant, might there be an additional criterion that needs to be met in attempts to model the TS image (not that one welcomes making an additional cross for one’s own back). PPS: I should have researched scanners and how they operate before posting the above comment. In fact they do have a lens in the scanner unit. Apologies for that. But there’s another factor that may be relevant, apart from optical hardware. It’s the distance between the scanned object and the scanner sensor, which is bound to be much smaller than the case with point-and-shoot photography. Might a scanner be better able to detect subtle differences in the surface, especially superficial ones that escape conventional digital photography? Oh, and I meant to say “making a rod” not cross for one’s own back. Colin, what does “scanning” mean? The Haltadefizione “scan” is not using a laser beam, but a camera attached to a rail-robot system, controlled by a computer. 1649 photos were taken of the Shroud, then reassembled on a computer, resulting in a 72GB photo file. This photo file has never been shown publicly (at the resolution taken), not even on the app Shroud 2.0, although many people think so. What is on Shroud 2.0 is a lower resolution. Mario (above): This photo file has never been shown publicly (at the resolution taken), not even on the app Shroud 2.0, although many people think so. What is on Shroud 2.0 is a lower resolution. It’s described as an “indispensable tool for researchers”, as indeed it probably is. But is it available to researchers? If so, then why no details on the Halta site about how to gain access, beyond those relating to the feeble Shroud 2.0 (a damp squib if ever there was).? Thanks Colin and very well articulated. Will we see acknowledgement of error? Unlikely. Ref Colin’s illustration of the tomb portage or pre-burial scene at Jan 22, 6:14 am, is indicative I think of the general lack of forensic knowledge by many medieval and later artists, with perhaps the sole exception of Da Vinci who dissected many cadavers until forbidden to do any more. The corpse is bent at the waist and so clearly not depicted in a state of rigor mortis. This contrasts with the assertions of Barbet. Barbet’s scenario for the transport is that the body was so stiff, that the cross-piece was removed from the upright with the arms still attached and the body was easily transported the very short distance to the tomb by five men: two holding the cross-piece (patibulum); two with a band supporting the waist; and one at the feet. There was no “stretcher” as otherwise the blood marks would show signs of smearing, and indeed this seems to be Barbet’s explanation for the blood mark across the small of the back from the supporting band. Likewise the arms (sinistral arm only visible) in the illustration are shown hanging loosely at the sides. Barbet asserts that the nails would be removed at the burial site, and it would take some definite effort to break the rigor at the shoulders to bring the arms down to the sides. Hugh’s enthusiasts for other Shrouds, and Colin’s perspective, both asserting that the present TS was used for transport, are therefore incorrect. Might one assume that it’s the concept that is being targeted, daveb (imprinting at transport)? Are the details of that hypothesis being scrutinized and filtered to oppose a perceived agenda? No agenda (on my part). The route to a sweat/blood imprint of a crucified man, probably modelled by an entrepreneurial medieval artisan, 13th/14th century, came directly from a consideration of the TS image characteristics (and radiocarbon dating). Checklist: faint negative image with bloodstains, 3D properties, scorch-like spectral signature, suggestive of a contact imprint. No evidence of pre-interment preparation or post-mortem decomposition, least of all irradiation by energetic sub-atomic particles. If it looks like a sweat/blood imprint, real or modelled, then it probably is one (stripping out the 20th/21st century interest initiated by the David Rolfe with his carefully crafted, mystery- mongering “Silent Witness”, 1978 and coordinated Sunday Times Colour Supplement feature). Yes, the latter turned this head too, but only for 33 years. Scales finally fell from this Johnny-Come-Latelys eyes. It’s taken all these years to learn DR’s real theist moral-rearmanent agenda (is there still an Oxford Movement?). Good luck to him I say. Some of us prefer to hang loose on those issues that so preoccupy our unanointed ‘Bishop of Beaconsfield’. Correction: The Oxford Group, not Movement. (The two are often confused). Oxford Movement: Composed of High Church Anglo-Catholics, published “Tracts for the Times” 1833-1841, advocating return to certain traditional Catholic practices. Leading lights included Pusey, Wilberforce, Keble, and John Henry Newman, which last eventually converted to Roman Catholicism, was made a Cardinal and became a major English apologist for Catholic doctrine and was recently canonised by Pope Benedict who visited England for the purpose. Oxford Group: A group founded by Lutheran Minister Frank Buchman, ~1921, developed concept of moral re-armament, and becoming known as the Oxford Group by 1931. There is a more recent Oxford Group, experts in a type of radio carbon dating of artefacts, but like many other scientists not as aware as they ought to be of certain fundamental principles concerning essential methods of representative sampling. My fundamental points in commenting above were: Prevalence of wide-spread ignorance concerning basic forensics until modern times, leading to faulty and unrealistic representations in depictions of Christ’s crucifixion and burial and hence faulty popular conclusions; Based on forensics from the TS, it is unlikely that Joseph of Arrimathea’s shroud was used for transport purposes. The results of radiocarbon measurements at Arizona, Oxford and Zurich yield a calibrated calendar age range with at least 95% confidence for the 3 contiguous samples of linen assigned to each of the 3 laboratories from a chosen corner of the Shroud of Turin of AD 1260 – 1390 (rounded down/up to nearest 10 yr). 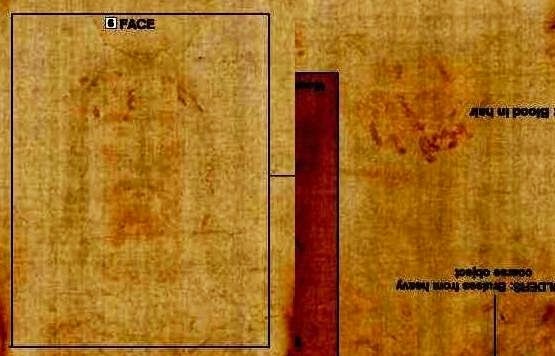 These findings, while demonstrating that the sampled linen of the Shroud of Turin is medieval, may or may not be confirmed for the entire Shroud: further testing from a larger number of sites, some less peripheral, closer to image-bearing areas, will be needed to confirm these preliminary data. The results of radiocarbon measurements from the three laboratories on the four textile samples, a total of twelve data sets, show that none of the measurements differed from its appropriate mean value by more than two standard deviations. A more rigorous and detailed statistical treatment of data, while desirable, is unfortunately not possible, given the non-randomised apportionment of contiguous samples to each of the three laboratories. Having acknowledged the limitations of the sampling frame, and the preliminary nature of the dating exercise, the results for the three control samples appear to agree well with previous radiocarbon measurements and/or their independently measured historical dates. Unfortunately not, as the photo shows. See where the cut goes. As today’s half of the “Sindon Munda” in Kornelimünster is is approx. 1.80 m wide and 1.05 m long, and the cut is paralel to the longer edge, the original size of the Sindon Munda must have been about 1.80m x2 m -twice as much -but in a different proportion (1:1 instead 4:1) than TS. “1527” is obvious on the dorsal side of the Noalejo’s shrouds. Look at the 1571 Alloy painting which shows exactly the same epigraphy, and we don’t see “IN 1571”, just “1571”, with the same characters than those found in the Noalejo’s shrouds. In the latter reproductions of the Shroud, the letters are different and much more similar to our modern numerals. This strongly suggests that the Noalejo’s shrouds were truly painted in 1527. This sentence makes no sense. In this case, why 1527 ? The Noalejo’s shrouds were painted in 1527. Therefore, ” Charles should reconsider some points of this article”. My sole point was that in Epigraphy (yes, the science of study of inscriptions and texts) you ought to transcribe literally the text and then interpret it. This is a formal lack of the studies by the CES and others that points to other general failures that I named. Fakers and copyists get used to puting false dates to cheat or dignify their copies. This is a very common fact. You have to remove this possibility before to draw any conclusion from the Noalejo shroud. And this is a work for Archaeometry and History. You cannot dating an artefact on the sole basis of a date put on by nobody knows who. This is an indication, but not a definitive one. Last, but not least, the colour of the Noalejo shrouds is more intense than the Shroud of Turin. You can draw any conclusion of this? By the way, “Alloy” is “Alcoy”. I am not sure why I should reconsider ‘this’ – ‘ presumably my HT – article on the basis of the Noalejo shrouds. We have to rule out for a start that they themselves have not faded over time. Then you have to place them against the mass of descriptions, one of which I have provided, others in my article, that show what an impact seeing the a shroud had on observers with its prominent bloodstains, plus the many depictions we have of it which show features such as the Crown of Thorns and long hair at the back that have clearly disappeared. Do you really think that enormous crowds of pilgrims would have come across Europe for a single day of exposition when many of them must have been several hundred yards away if they could not see the images? It really. Is a non- starter to use ancient copies of the Shroud, which may have faded themselves, and ignore the far greater mass of evidence that suggests otherwise to argue that the Shroud images were originally faint. The basic problem is the assumption that the Shroud today is exactly as the Shroud has always been, seven hundred, or two thousand years ago. If it was it would truly be miraculous, transcending the normal laws of nature and decay even after it has been subject to hundreds of foldings, unfolding, having rosaries thrown at it ( the pilgrims waiting for their return can be seen in the Tempesta engraving) and stored we know not in what conditions between expositions. A miracle indeed! Las copias de Noalejo MANTIENEN los pigmentos pictóricos. La Sábana de Turín CARECE de pigmentos pictóricos. “The components of the pigments used for these copies appear without difficulty when analyzed in the laboratory. The images on the Noalejo copies were painted with some kind of soil pigment. A preliminary analysis of the samples identified the presence of tin (Sn), lead (Pb), calcium (Ca), aluminium (Al), iron (Fe), and other heavy elements. Figure 25 shows an example of a spot analysis. For more representative results, microanalysis on eight particles found in the image sample CE1 were performed and the sum of the atomic percentages of the elements determined by EDX (Energy-Dispersive X-ray Spectroscopy) is shown in Figure 26. Nickel (Ni) may be another component in the pigment. There was no previous preparation for the cloth and no oil was used. Figure 23. Photograph with optical microscope of the pigments of one copy of Noalejo. Figure 25. Spectrum of dispersive energy analysis made on the pigments of one copy of Noalejo. Presence of Tin (Sn) and Lead (Pb). Figure 26. Sum of atomic percentages for each element determined by EDX for eight particles found in the image sample CE1. Aluminium (Al), tin (Sn), iron (Fe) and nickel (Ni) may be the main components of the pigments. Don’t manipulate my sentence, please. “If these enquiries confirm the date that figure on the cloth, Charles should reconsider some points of this article”. (I will have to register my copyrigh)t.
I am sure that I shall have to reconsider some parts of my argument when we have specialist input that we have not yet had. 1) We are still at the beginning of serious Shroud research in many areas as so much previous research has been badly focussed and so many areas have still not had specialist academic input. 2) The Shroud now is not as it once was and we should be focussing on discovering how it looked originally. This would bring Shroud research into line with research on other ancient artefacts. I have never come across another artefact, especially one of vulnerable material, which is assumed to be totally unchanged over centuries. I assume that all those who are contributing to this learned debate on how the images on the Shroud looked originally will have their Beldon Scotts to hand. If you can’t get hold of the catalogue of the Savoy collection, it is the fullest panorama of the evidence we need to discuss the issue and second hand copies are available on Abebooks. The great architect of eighteenth century Turin, Filippo Juvarra,contributed an engraving of the ostension of 1737 ( now in the Royal Library in Turin). It is on page 257 of Beldon Scott. The crowd is massed in good order in the Piazza Castello ( they had tightened up the procedure since the chaos shown in Tempesta’s engraving of 1613) and I suspect that it is the architectural setting that most interested Juvarra- there is a wonderful Barogue viewing pavilion- but he presents the whole facade of the platforms. So the Shroud is at quite a distance but you can still see the images on it. Would Juvarra, and so many other artists, really have shown the images if they could not be seen and why would the Savoys arrange this ordered viewing by an enormous audience if hardly any of them would have been able to see the images. It does not make sense to me. Of course, Juvarra’s is only one of many depictions showing the images more clearly than they are now and with features that have not vanished with time. As I always say to anyone who asks me how to recreate the images on the Shroud today: ‘Have you got five hundred years to spare?’ It needs time and constant handling/ exposure to the elements to create faded images on cloth or to allow the pigments to disintegrate leaving only shadows where the paint once was. La Sábana de Sanlúcar de Barrameda, excepcional y única porque interpreta la imagen de la Sábana Santa en POSITIVO, carece de corona de espinas y de “perizonium”, tiene el cabello largo……. y fue ¡REGALO DEL PAPA! al embajador español en Roma, Conde de Olivares*. La Sábana de Sanlúcar mantiene perfectamente los pigmentos pictóricos. El Conde de Olivares regaló la Sábana al Duque de Medina Sidonia, señor de Sanlúcar, quien la donó junto a otras reliquias al Santuario de la Virgen de la Caridad (que él fundó) en el año 1613 mediante “carta de donación”. Creo que la hipótesis (?) de Charles Freeman tiene “agujeros” por todas partes. * Enrique de Guzmán y Ribera, embajador en Roma (1582-1591) y posteriormente fue nombrado virrey de Sicilia y virrey de Nápoles. I think we’re going round in circles. Charles is certainly correct that most of the pictures of ostentations, of all ages, are clearly defined full length portraits, and his critics are certainly correct that most of the actual copies of the shroud, of all ages, are as faint or nearly so as the Shroud itself. (Carlos’s picture above being a notable exception) The problem is to reconcile these two different styles of representation. There are several approaches, technical and cultural. Firstly, almost all the illustrations of ostentations in Beldon Scott are of engravings or woodcuts or prints, which do not lend themselves to indistinct representations of anything, while the copies in cloth mentioned above are paintings, which can be as faint as you like. Secondly, on those rare occasions when colour appears, it is invariably monochrome. Of course an engraving could hardly be anything else, but the della Rovere paintings show a monochrome image, and a poster for the 1684 exposition, which is mostly engraved but had a woodblock insert just for the images, has that wood block print in sepia. 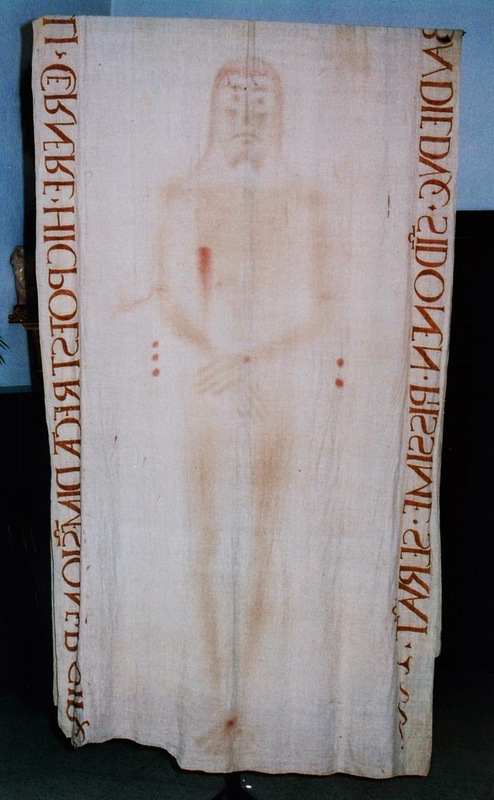 Thirdly, the USP power of the Turin Shroud was that it held the two-fold image of Christ, not that it was just longer than its rivals in France, nor even that it had blood on it. Even if the pilgrims who came to see it never actually got close enough to observe it directly, they could buy a souvenir showing what they would have seen if they had had the chance. Fourthly, as I have argued above, if the Shroud was originally made for a Quem Quaeritis ceremony then it was essential (as OK picked out) that it was not a painting of Christ lying in his shroud, but a representation of what he might have left behind. This makes more sense to me than a forged miracle, when in general the more “miraculous” it looked the better. Fifthly, by the time the shroud reached Chambery, let alone Turin, it had ceased to have any connotations of ‘realism’, and had become a ‘my relic is more magnificent than your relic’ status symbol, so advertisments, before or after, of ostentations not only showed a more magnificent representation of the shroud image, but also the magnificence of the management of it, with dozens of clerics and soldiers in serried ranks. There is an interesting comparison to be made between the Tempesta engraving of 1613 and the Bolkmann painting of 1686. Both are crammed with the same sort of people, but the impression in the earlier one is of chaotic enthusiasm, with soldiers rather vainly squashed up against the ostentation dais as the populace crush forwards, while in the Bolkmann, there is very clear military order, the crowds being firmly kept in place behind regiments of cavalry. In the first, the image on the Shroud is very visible, in the second, wholly hidden behind a silk cover. I’m interested in Bolckmann. He is wholly unknown to the internet other than for this one painting, which is described by Beldon Scott as “a unique visual document recording with remarkable accuracy the appearance of one of these events.” However, I’m not sure I agree with Beldon Scott’s rationale for his painting “the climactic moment when the attending bishops pull back the red silk covering.” I don’t think it had anything to do with the moment. I think the reason his painting doesn’t show any more than the bottom few inches of the shroud under its red silk covering was because he was honest enough to know that there was actually almost nothing to see, and that from the viewpoint of the painting it would have been a blank white sheet. I think you gave the answer. The illustrations of ostentations are constrained by technical considerations. The painted copies are not constrained. Conclusion: the illustrations of ostentations can not be a reliable source for the the knowledge of the TS as it was seen at the time. The painted copies are the only one able to give some information about the TS as it was seen at the time. In this sense the study of the shroud of Arquata is very important. But Charles does have a point. However indistinct, the man in the shroud has his feet together and is wearing neither a loincoth nor a crown of thorns, whereas the engravings nearly all have separated feet and are wearing a loincloth and a crown of thorns. It’s as if they were copying a standard, and if it was not the Shroud itself, I wonder if there was a statue, or painting, of the man in the shroud, now lost, which was there for pilgrims to see if they came when no exposition was going on. I believe nowadays there is a reproduction of the Shroud hanging above the altar in which it lies, for just such people to see. That statue perhaps had all the characteristics we see in the engravings, separates feet, loincloth, crown of thorns or whatever, and the engravers then copied that onto their pictures, even though they knew that the real thing was nothing like it. In some cases they may never have seen the real thing at all. I think there would have been some documentation of this. We know that Tempesta, who was known for the accuracy of his engravings,see his Rome of 1593, a copy of which is still in Turin, was in Turin at the request of the duke, to see several expositions and although we only have documentation of 48 expositions between 1600 and 1700, it is suggested that they might have been every year. We also know,see Beldon Scott, that visiting ‘saints’ were allowed to see it and de Beatis, see challenged quotation above!, arrived with his cardinal and instructions were given for them to see it( in Chambery, of course). So I don’t think you needed a statue as well. I do increasingly wonder whether, in line with similar painted linens, that there was not some repainting done from time to time- see the loincloth issue. Do you think that the drawings of public exhibitions (the basis of Charles’ claims) do represent the TS as it was or do you prefer to look at the many paintings which were made (for most of them) by a direct viewing of the TS? I don’t want to cut in in front of Hugh but a simple point needs to be made. We are exceptionally lucky in having a very rich collection of representations of the Shroud as it once was. Some of these, invariably by unnamed artists, are copies on textiles which may or may not have faded with time. Some are on lead, the Liery Pilgrim Badge. Some are engravings,some etchings, some lithographs. Some are competent, some are amateur. Some show some features such as a Crown of Thorns, others, if only a minority,do not. Virtually all them how the hair on the back of the head as falling down across the whole nape of the neck, something that can no longer be seen today. In some cases we know that the artit or engraver was exceptionally competent. Antonio Tempesta, for instance, was famous for his engraving of Rome of 1593 which can be accessed through the Metropolitan Museum, New Yrok, website. So famous was he that the Savoys asked him to Turin and he produced a composite view of the exposition ( it is composite in that it includes the Shroud coming in its carriage to the site where it was displayed as well as the display itself .) it is hard to imagine that in this one instance he was faking what he saw. I have consistently argued that this enormously rich resource for the study of tHe Shroud needs to be assembled on one database so that it is accessible to anyone, specialist in art history or not, to study. It is quite extraordinary that it has been completely neglected. There will be features once on the Shroud that can be seen on both copies on textiles and engravings but if we persist in putting copies against engravings we will get nowhere. Some of each are competent ,some of each are incompetent as with any other works of art. So please let’s move on and hope that someone will come forward to finance this work. It is not just that the images are more clearly defined -it is that they consistently show features that are now lost.This suggests that the images are not now as they were then which is the crucial point from which I conduct my own research and encourage those who ask me to do likewise. It is the same method I used in my book on the Horses of St,Marks. Yes, we can learn a lot from looking at them today but we must take them back to their original context and condition if we are to understand their origins. In fact, I am only following the normal approach to ancient objects. I am not sure why Shroud researchers start the other way round in believing that what exists today is somehow more meaningful than what existed centuries before. Perhaps it is because none of them have ever systematically studied any other ancient object. I am glad we, or at least Hugh and I, can argue from Beldon Scott. Figure 163 shows the same ostension as the Bolckmann does but from close up while his is from a great distance- It is difficult to argue,contra Beldon Scott, that the image on the Shroud is not there when it is very much there in detail in Boglietto’s etching of 1683 which is a good example as it clearly shows the Crown of Thorns, the long hair on the neck and the thumbs in a similar way to other depictions. Not all depictions are detailed enough to show the now vanished thumbs but so far as I can see most show them pointing out at an identical angle suggesting that is how they once were on the Shroud. Why would Bolckmann be the only person to show a depiction lacking the images (and it is not clear that they are not there) when everyone else seems to have reproduced them? Were all the other artists conned over a period starting from the very distinct images of the Lirey Pilgrim Badge onwards despite the change of owners. Whether etchings, engravings or lithographs, whether 1578, 1683 or 1842 they all show strong images. It is only in the ostension of 1868 (B.S. p.296) where we clearly see a deterioration in one image and the artist Perrin had no problem in showing part of the front image as faint and the rest similar to early depictions. So why did all the others have this problem and what would be the source of the Crown of Thorns and long hair in the back if they were not there? 1868 was also the first ostension where the Shroud had to be placed within a frame – a sign that they knew that it was deteriorating. Beldon Scott is good on how the influence of the French court ( Louis XIV) made the ostensions very much more ordered than they had been in the chaotic days of Tempesta. Either the Shroud looked much as it does today, in which case we must explain why the engravings are so clear with their loincloths and crowns of thorns, or it was much better defined, with loincloths and crowns of thorns, in which case we must explain why the paintings are so faint and tenuous. I have tried to see both points of view, but cannot help finding the engravings easier to ‘explain away’ than the paintings. Rather like souvenir postcards of Roman ruins, they were created to show what was ‘meant’ to be there rather than what actually was there. I have only heard a couple of arguments the other way – one that the faint paintings were as bright as the Shroud but they too have faded with age, and the other that they were copies of something else. Neither of them ring true with me. Charles is quite correct that we ought to try to imagine what the Shroud was like when it was first created, and no doubt the cloth has yellowed and the blood largely rubbed off, but the earliest Ab Originale copies are too similar to its present appearance for me to think it was very different. However, I do not see that having a fainter appearance detracts from Charles’s Quem Quaeritis hypothesis at all, quite the reverse; it strengthens it, as I have explained above. We have to rule out that the copies have not faded. If linen paintings were not so vulnerable we would today have hundred of thousands of them of all shapes and sizes and with every kind of image today. That is what the inventories both of domestic houses ( the York study) and churches and monasteries have so many of them, all, with a very few exceptions now disappeared. I still think that the images on the engravings, lithographs, etchings ,etc would not have shared similar features if these had not been visible to the different artists who had to provide copies. The blood was important – apparently the members of the Savoy family used to kiss the wounds before the Shroud went on display. We are lucky to have the Shroud – the Savoys could hardly throw it away if, in my view, it began to deteriorate in the nineteenth century. In England it would, of course, have been burned at the Reformation along with the lucrative Blood of Hailes and other relics purporting to originate in the life of Christ. In favour of Charles’s hypothesis about a late degradation of the Shroud image: The altar boys of the church of Noalejo used to play with the shroud, by disguising themselves as ghosts. This is not a good way to conserve paintings in cloths, I suppose. A degradation process similar to the Shroud is plausible. P.S. Yes, Hugh is right . My argument for the Shroud having been created for a Quem Queritis ceremony does not depend on the images being faint or not. It would have been a much smaller congregation and so long as some sort of effort was made to show the imprints ( and in many cases the clothes probably have had images at all or perhaps just a pattern of bloodstains) then the ritual needs would have be satisfied. Yet, when we read of church inventories that have a hundred or more painted linens, many simply to hang up in the church, then there would be no need to create some kind of exotic technique specially to create the images on the Shroud. The expertise would have there but so is the evidence that these paintings were very vulnerable to decay and disintegration leaving we know not what traces of their presence. Yet I still think the evidence is a) that they were more vivid than they are now b) that there were features on the Shroud now lost but even if the surface of the Shroud was , in some inexplicable way, unchanged over the centuries, it could still be used in a traditional Quem Queritis ceremony without anyone complaining. This was both funny and on the mark. It deserves more hat tips than it thus far has received. Right and wrong, Thomas. There are holes in Charles’s arguments, as I have clearly pointed out above, but there are also coherent pieces which cannot be swept aside with the holes. That the Shroud today is not exactly as it always has been is surely not in doubt. Most of each bloodstain has disappeared, leaving only a few flakes jammed in the interstices of the threads, and the entire cloth has yellowed with age, possibly reducing the contrast. That is not to say that it was once a full colour painting of a dead man covered in blood, and I agree that the Lier copy (even though that too has no doubt deteriorated in detail) is probably a fair illustration of the Shroud as it ever was. However, as Charles, points out, engraver after engraver produced images of the shroud which, although very similar to each other, are nothing like the Shroud as we know it. Unless extensive repainting and unpainting is invoked, it is difficult to explain why. The particular aspect that intrigues me is that the feet are usually seen widely separated and pointing outwards, whereas the Shroud has them close together (overlapping) and pointing inwards. We are at the beginning of serious research and we have lots to work on even if there is no access to the Shroud itself. Sorry Hugh, but I beg to differ re the stated position of the feet on the TS. I may be out on a limb here, but even with my (arguably) best imaging, using the enhanced 2008 BBC/Haltadefinizione (edited to 25/50/-100 brightness/contrast/midtone in MS Office) I see no clear evidence for the feet being crossed. 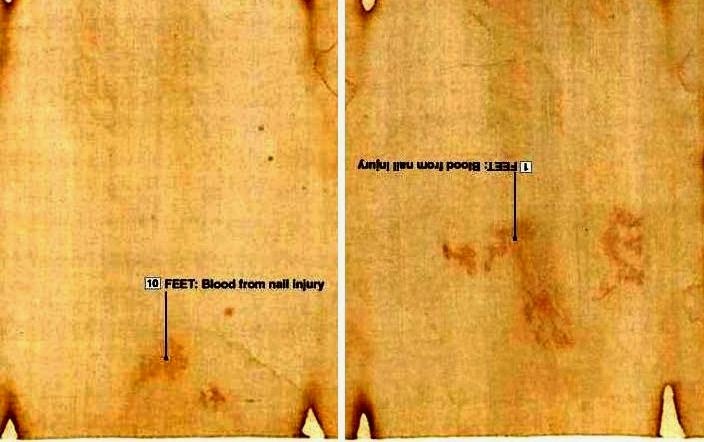 Admittedly one might imagine that to be the case from the frontal image (left above), where there’s a vague diagonal slant of one foot (viewer’s left) to the right, and assuming a single nail based on the presence of just one prominent bloodstain. But that interpretation is not supported in the dorsal image (right) where there would seem to be soles of both feet being separately imaged, albeit less convincingly than one might wish for. Who’s to say that crossed feet are not a somewhat fanciful interpretation, introduced by an early artist of some renown, one that was subsequently accepted as ‘gospel truth’ by his contemporaries and later generations, but more an article of faith – or unquestioning belief – than anything else? None of this detracts of course from your note of caution above. If anything, it makes the need for caution even stronger. PS Afterthought: the Lirey Pilgrim’s badge shows crossed feet, frontal and dorsal. It’s understandable that has been seen as the gold standard (well, lead/tin alloy) where image interpretation is concerned. But without knowing who produced the badge, and/or the accuracy of his own observation and interpretation, we’d be unwise to consider “crossed feet” to be an established feature of the TS. Yes; I deliberately avoided the word ‘crossed’ and put ‘overlapping’ in brackets so as to try to fudge the description! Whatever their precise position, they are clearly different from way they are depicted in most of the engravings, well apart and pointing outwards. 1/ In 798-802, as a token of his esteem, Baghdad Caliph Harun al-Rashid (763-809), offered Charlemagne a brandeum or substitute relic of the Matthean “Sindon Munda”/”Sindon Kathara” as gift. 2/ The mot likely original size for the Kornelimünster substitute relic called “Sindon Munda” is 480×120/125cm. 3/ In the mid-9th century the Kornelimünster monastery (under Benedictine rules) became imperial abbey and received three Saviour’s relics that were kept in Aix/Aachen: the loin cloth, the Sindon munda (Around 875 CE an exchange took place: Charles the Bald gave a relic of the head of the martyred Pope Cornelius for half of the shroud for the establishment of his monastery in Compiegne in France) and the sudarium Domini, the beloved disciple and Shim‘on Kefa found in the empty tomb. The fact is the Compiegne Shroud and Kornelimünster Sindon Munda were the two halves of the same representative relic or brandeum cut in two halves around 875. IT shall not be mistaken for the Sudarium Domini. 4/ The Compiene halve was several times re-cut to get more brandea out of it and as such is not reliable to infer the original size of the brandeum Baghdad Caliph Harun al-Rashid gave Charlemagne. “As position of the cut indicates, the original size of this cloth must have been not 4x1m (like TS) but about 1,8 m x 2m”. I am happy you have admitted that,Max. The non-imaged original representative of the Shroud of Christ seems to refer to the TS as if the dorsal and ventral images were seen side by side and not upside down in head-to-head discontinuity. Ever since 817 CE, the Benedictine monks of Kornelimünster near Aachen (Aix-la-Chapelle) claimed to possess the Sudarium Domini (size 352 cm wide and 650 cm long that was over his head ) together with the apron or Linteum Domini (Last Supper relic) and the “Clean Shroud of Christ” or “Sindon Munda” (most likely a representative relic or brandeum. In 1468 CE illustrations of the three relics (see THE SACRED LINEN-CLOTHS OF CHRIST’S PASSION IN EGYPT by Otto F. A. Meinardus, Winter 2003 • Coptic Church Review – Volume 24, Number 4, p. 108; link https://www.google.fr/url?sa=t&rct=j&q=&esrc=s&source=web&cd=6&cad=rja&uact=8&ved=0CEwQFjAF&url=http%3A%2F%2Fwww.copticchurchreview.com%2FCoptic%2FHome_files%2F2003%2520Winter.Vol24.%25234.pdf&ei=cbbHVKLKNs3ksATMo4CYBA&usg=AFQjCNEVzMNBbAaPcdmNxaLaD-G75IUdRQ&sig2=uIv9YtJO02CeA-FeqPl06w) both the Sudarium Domini and Sindon Munda are featured only with “drops” (neither face nor body image). No doubt, Charles (sticking to his pseudo-intellectual reasoning — along with Hugh?) would infer “drops” were originally painted at one point in time on the relics/substitute relics but disappeared at another point in time through folding and unfolding, which is NOT the case. Thanks for introducing us to those quaint little woodcuts, with which I was not familiar. I believe the actual Kornelimunster relics lack any images, except for a blur in the schuztuche which is sometimes interpreted as the dirt from Judas’s feet. However, as you point out, the 15th century woodcuts show them covered in drops of blood, which they clearly don’t have. Quite possibly the engraver had never even seen them. I agree with you that the relics never had any more marks than they have now, so perhaps you would like to speculate as to why the engraver (deliberately?) misrepresented them. It may shed light on the Shroud of Turin. I am so glad we are moving the rich collection of depictions, accurate or otherwise, of the Shroud into the debate. Progress in a new direction at last. I have looked up the full text (in English) of the Antonio De Beatis- the original is in fact in Italian not Latin as I imagined it would be from the chaplain of a cardinal. The full text in translation is published by the Hakluyt Society, 1979 (there had apparently been an ‘unreliable’ French translation in 1913 but the 1979 translation is the first in English). It was exhibited to pilgrims on Good Friday and for three days in May from the (Chambery) castle wall and pilgrims would gather to see it in a meadow outside the town walls. De Beatis goes on to tell us that the Savoys used to take it round with them but plague broke out in Chambery when they did so and now that it was securely kept at Chambery and the outbreaks of plague had ceased. I never imagined for a moment that the images as they originally were could not be seen from a distance and this seems supporting evidence. As early as 1207, the image of Yeshua’s DEAD NAKED body on the Constantinople Sindon is described as aperilepton, “elusive” (= unsubstantial, illusory, evasive, mysterious). This is at one and the same time totally consistent with the TS man image and in striking contrast with Charles’ opinion the TS man image was originally painted with a crown of thorns and loin cloth in 1325 CE± 65! In the Rothchild Canticles (f. 84r), ca 1300 CE, the Shroud of Christ as an expanse of shining white cloth twisted into a knot and bearing two disembodied twin-like heads and a dove, stands for (the Triumph of ) the Holy Trinity. It is a simulacrum of the ultimate Holy Grail/Graal-like vision mystics aspired to. G-d’s messenger and martyr par excellence is Yeshua’ whose dead naked body shines on his burial cloth as an emblem of his resurrection. Painted copies (no matter how faint) of the TS man body do not shine. Only the TS man image does. Reminder: KYROS (Κύρος), “Lord”, is the Greek form of Hebrew Kowresh (Old-Persian kūruš or Khūrvaš ) meaning “sun-like”, to name Yeshu’a in the Gospels. Now compare it with the overlapping of the Holy Face of the Manoppello Veil and the Holy Face of the Turin Shroud. Ring any bell? Response to my ‘blood-compensates-for-faint- body-image’ from the eccentric strand of thought that would have us believe that the TS body image is all about disintegrating medieval paint pigment? Answer: zero. Why bother further when one’s own and others’ objections re blood and other crucial image properties (tone-reversed negative, 3D properties) persistently fall on deaf ears? Changing the subject: has anyone here ever tried mega-dosing on Vitamin C (say 1 gram or more per day, which may seem large, more than 12 times the UK RDA, but still only a third that recommended by Nobel Laureate Linus Pauling)? Vitamin C is the current preoccupation on my sciencebuzz site (the TS having been relegated for now for reasons to do with monotonous banging of drums). Single 1g doses of Vitamin C cause my finger joints to “crack”. My wife who, without any prompting or encouragement from me, offered her services last weekend as a guinea pig says the same – her finger joints are now cracking. Has anyone else here found that? Yes. I’m aware of the suggested link between joint noise and magnesium deficiency (with some folk taking the magnesium chloride supplement you indicate Carlos). But the joint noise (variously described a creaking, cracking, clicking) did not come on until after taking the first 1g tablet , finally went away after some weeks, and then immediately returned with 2nd, 3rd tablets. I suppose it’s possible that Vitamin C might cause loss of magnesium, explaining its action, but why 1g should have that effect is not obvious (the human body is said to contain 21-28 grams of Mg). One then mentally compares one’s own mapping with the actual. Hmmm. Now that’s interesting, at least to this pair of jaded but still quizzical eyes. Might there be the makings of a book here? Nah.Too much by way of bare bones, not enough flesh for an entire book. It might make a magazine article though. Can anyone here suggest or recommend a suitable magazine targeted at history buffs in the the general population, available on news stands, preferably an online presence too? But would it accept a few thousand words from this gifted amateur (admittedly lacking solid academic credentials, sigh) on the “real” history of the Turin Shroud? La utilización del cloruro de magnesio en las artrosis, y procesos similares, carece de base científica…..pero “funciona” en muchos casos, tras largos periodos de administración. Se lo administro a mi esposa en forma de polvo cristalino una cucharadita al día (es muy amargo y puede tener algún efecto laxante) y se lo he indicado a algunos de mis mejores amigos, siempre con muy buenos resultados que la medicación usual es incapaz de obtener. Con esa dosificación carece de efectos adversos. “The use of magnesium chloride in osteoarthritis, and similar processes, no scientific basis … ..but “works” in many cases, after long periods of administration. Would administer my wife as a crystalline powder one teaspoon a day (very bitter and may have a laxative effect) and I have indicated some of my best friends, always with good results that the usual medication is unable to obtain. Thanks for the interest. Probably best we stop there. Could Charles (AND Colin) account for an alleged “1325 CE± 65 monk” using an about 4,40 x 1,10m DOUBLY IMAGED cloth (implying it was wrapped around the body from head to toe) while the original size of the most famous NON-IMAGED representative relic of the Sindon Munda/Sindon Kathara (or Matthean “PURE/CLEAN cloth”, first kept in Aachen or Aix-la-Chapelle and then –after having been cut in two halves– Compiègne and Kornelimünster) was only about 2,10 x 1,80m and NON-IMAGED (implying it was wrapped around the body from one side to the other)? Do you mean that the original copy based on the SOT could have been made in more recent years than 1527 or that this only applies to the two Noaeljo copies? Of course you can´t exclude that the two Noalejo copies were based on another copy.